Blogging has unquestionably increased my confidence when interacting with people face-to-face; particularly when meeting people from the blogosphere. A bold statement, I realize. And how can it be when blogging entails spending hour upon hour at computer, typically alone? I began thinking what confidence really means. 1 firm trust (have confidence in his ability). 2a a feeling of reliance or certainty b a sense of self-reliance; boldness. Confidence is a sense of familiarity. By sharing my experiences, opinions and ideas on my blog and by leaving comments on othersâ€™ blog, people get to know me beyond my cerebral palsy or even before the cerebral palsy. Likewise, I get to know them through their written words. Hence, when we have the opportunity to meet in-person, thereâ€™s familiarity. They already know thereâ€™s more to me than my difficult-to-understand speech and my jerky movements, and, for the most part, we can bypass the initial awkwardness and carry our online relationship into the real world. And, from that, I gain confidence in my ability to approach people. That confidence has led me to do things that I may not have otherwise. 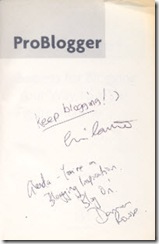 For example, I had been wanting to have my dog-eared and sun-faded copy of ProBlogger: Secrets for Blogging Your Way to a Six-Figure Income autographed by its two authors Chris Garrett and Darren Rowse â€“ both top-notched and well-respected bloggers in the blogosphere. They are what Iâ€™ll like to be when I become a grown-up blogger. Last year, after giving my rockinâ€™ presentation at SOBCon, Chris was still seated at his table without a crowd around him. Taking a deep breath, I wheeled over and handed him the book. He kindly obliged. At BlogWorld, with my presentation following Chrisâ€™s and Darrenâ€™s panel, I thought Iâ€™d have the perfect opportunity to ask Darren for his autograph. Unfortunately, the crowd wanting to ask them questions was too large; I had to get up on stage and set up for my presentation. I missed my opportunity and disappointedly thought I might not another chance to meet up with the Aussie blogger. Then, while waiting for the last keynote to begin, I spotted Darren sitting in the last row across the aisle from where I was. Now was my chance! Pulling out the book from overstuffed laptop bag and taking another deep breath, I wheeled over and tapped him on his shoulder. Not sure he knew me from blogger Eve, I was surprised he knew who I was and that he apologized for missing my presentation. He also kindly obliged. Thank you, Chris and Darren. Without blogging, I doubt I would have had the confidence to approach two industry leaders. What does confidence mean to you? What might you accomplish in 2010 if you had the confidence? I enjoyed this post and agree that blogging can increase one’s confidence. The regular organizing of thoughts and telling a story to strangers has helped me become a better manager when I’m asked to document someone’s performance or write what our product or service does. Excellent post. What an inspiring post, and I’m not saying that lightly. For me, confidence is believing that I have the resources I need to be who I want to be and do what I need or want to do. I’ve learned that those can be internal or external. For example, my Guide Dog and crutch help to give me the confidence that, within reason, I can walk safely. My friends provide me with the support and help I need when it feels like my resources are running low. as I build my support network and increase my skills in various areas, I gain confidence. Even my beading habit gives me confidence because I know the skills I use in it transfer to other things. Finally, for me, confidence means that I sometimes decide to take a risk and sometimes decide not to. In 2010, I’d like to increase my confidence in my ability to be successful in life even with the pain I face daily. My dream is to write another book, but currently I need to build more confidence.